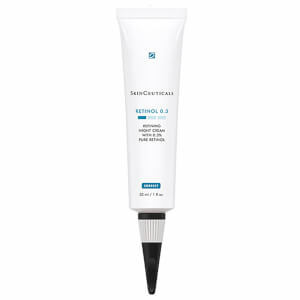 The SkinCeuticals Advanced Anti-Aging System combines a trio of powerful, scientifically developed treatments to dramatically reduce the appearance of visible signs of aging. Harnessing unique formulations with concentrated percentages of active ingredients, each product targets specific concerns to tackle wrinkles, uneven tone and discoloration. This combination antioxidant treatment offers 8x skin's natural environment protection against UVA, UVB, IRA, and pollution by neutralizing free radicals that cause accelerated skin aging. Proven to visibly improve wrinkles and skin's firmness, it has been expertly formulated with 1% alpha tocopheral (vitamin E), 15% l-ascorbic acid (vitamin C), and 0.5% ferulic acid to deliver unparalleled results in the form of a fluid, rapidly absorbed serum. The A.G.E. 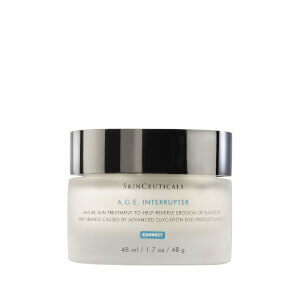 Interrupter is a multi-faceted product specifically formulated to improve the creping, thinning appearance of mature skin. Proven to significantly improve skin's elasticity and reduce the appearance of wrinkles by 20%, it is a unique skin treatment formulated with 30% proxylane, 4% blueberry extract, and 0.2% phytosphgosine. An intensive night concentrate that boosts skin’s endogenous defense system to help repair and prevent accumulated damage. 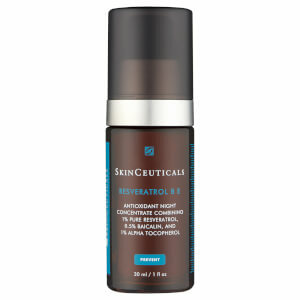 Combining an antioxidant-rich blend of 1% pure, stable resveratrol, with 0.5% baicalin and 1% vitamin E, this patent pending antioxidant cocktail neutralises free radical damage and effectively strengthens skin’s protective barrier functionality. Achieve a significant improvement in the appearance of radiance, elasticity, and density. 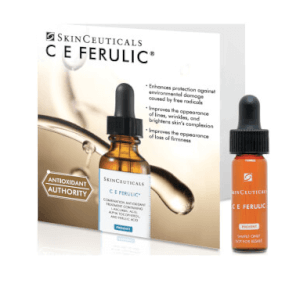 C E Ferulic: Water, Ethoxydiglycol, 15% L-Ascorbic Acid, Propylene Glycol, Glycerin, Laureth-23, 1% Alpha Tocopherol, Phenoxyethanol, Triethanolamine, 0.5% Ferulic Acid, Panthenol, Sodium Hyaluronate. A.G.E Interrupter: Aqua/Water, Propylene Glycol, Dimethicone, Hydroxypropyl Tetrahydropyrantriol, Cyclohexasiloxane, Isohexadecane, Glycerin, Synthetic Wax, Dimethicone/Peg-10/15 Crosspolymer, Aluminum Starch Octenylsuccinate, Phenosyethanol, CI 77163/Bismuth Oxychloride, Magnesium Sulfate, Salicyloyl Phytosphingosine, Acrylates Copolymer, Vaccinium Myrtillus Extract, Methylparaben, Ethylparaben, Disodium EDTA, Parfum/Fragrance, Butylphenyl Methylpropional, Coumarin. Resveratrol B E: Aqua / Water / Eau, Dimethicone, Propylene Glycol, Dipropylene Glycol, Niacinamide, Alcohol Denat., Glycerin, Caffeine, Sodium Chloride, PEG/PPG-18/18 Dimethicone, Tocopherol, Resveratrol, Scutellaria Baicalensis Extract / Scutellaria Baicalensis Root Extract, Disodium EDTA..
My dermatologist recommends this line so I gave it a try. So far, so good. I do find the need to add some other moisturizer or oil like Marula on top of the creme because it seems tight, especially under makeup. This calls for spritzing my face several times over the day with rosewater or some other moisturizing face spray. I haven't been using it long enough to see miracles, but my skin seems to be responding well. Initially, I had a few small pimples pop out but they were more like clogged pores than an actual pimple, and they disappeared within a day or two -- nothing hideous or major like a cystic bump. The system is expensive, and I guess I will see how long it lasts. That will determine whether or not I keep using it. I am 72, have no deep wrinkles, and in fact very few fine lines at all, because I have always taken good care of my skin. Therefore, I was mostly expecting to maintain with some improvement rather than cause a miracle!